William Good (Nanaimo / Coast Salish). William Good was born in Nanaimo in 1950 and is a member of the Hulkamalum (Coast Salish) Nation. He's been an artist for 40 years. 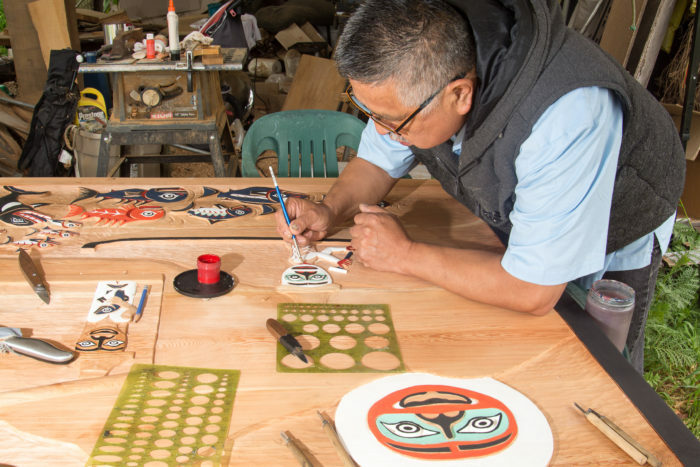 He learned carving, painting and designing from Samuel Nelson (Tsimshian), Jack James Jr. (Kwagiulth), Sampson Robertson (Kwagiulth), and Harvey Williams (Dididat). In 1987 William took a printing course at Malaspina College, so that he could produce his own clothing. He studied silver and gold jewelry carving, as well as stone setting, bezel setting, and bead setting with Dennis Matilpi (Kwagiulth). William carves bentwood boxes, totem poles, masks, and all Northwest Coast Native carving. He creates Native designed cotton and melton clothing. And he creates beautiful jewelry of silver, gold and precious stones. William's goal is to revive Hulkamalum (Coast Salish) art. Click to view William's carved steam bent boxes, wall plaques, and totem poles.